This project, a work in progress, documents the religious experience and cultural production of Latvian Baptist immigrants to North America before World War II. The primary goal is to research the periodicals and other publications generated by these immigrants. The nexus of the Latvian Baptist communities in North America was Philadelphia, and in particular West Philadelphia. As a first phase, this project is documenting the individuals who lived in West Philadelphia, several of whom were the editors, writers, and poets whose work appeared in Latvian Baptist publications of the period. Using the form below, visitors to this site may search for items, persons, and other keywords associated with the community. 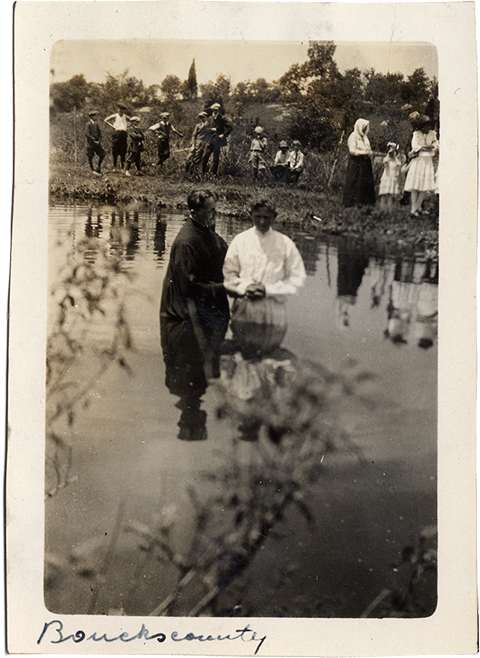 Do you have information about or artifacts related to the early Latvian Baptists in America? Contact Andris Straumanis and help build this documentary project. In 1912, as part of an appeal to raise money for a new church, the Rev. 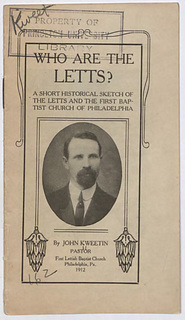 Jānis Kvietiņš, then pastor of the First Lettish Baptist Church of Philadelphia, wrote a 16-page pamphlet on the history of the Latvians titled Who are the Letts? : A short historical sketch of the Letts and the First Baptist Church of Philadelphia. A rare artifact — a photographic postcard showing all members of the Philadelphia Latvian Baptist Youth Society (Filadelfijas latviešu baptistu jauniešu biedrība) in 1916 — provides a gateway to creating a portrait of the immigrant religious community. 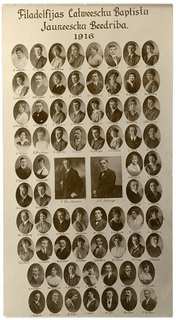 Using the names of the 72 individuals pictured on the postcard, the research has attempted to locate them primarily in the 1910 and 1920 U.S. census data, as well as — in the case of males — in draft registration cards from 1917. Copyright 2016-2019 by Andris Straumanis. Credits: Powered by Omeka. Map visualizations via CARTO and OpenStreetMap. Timeline created with TimelineJS, an open-source product of Northwestern University's Knight Lab. Some icons thanks to Font Awesome by Dave Gandy.